Diego area. The meeting was led by the Los AngelesCounty Department of Health and took place onTuesday, February 27 in the Monrovia Public LibraryCommunity Room. W. Maple Ave.). Concerns and questions aroseafter a hepatitis A outbreak hit the San Diego area. On September 1, 2017, San Diego declared a localemergency, as a result of the outbreak within thecommunities dealing with homelessness and illicitdrug use. The emergency was lifted on January 23,2018 and, by February 27, 2018, there has been 583cases reported in San Diego County, including 20deaths and 399 hospitalizations. Though Los Angeles did not see an outbreakas immense as San Diego, the county felt it wasnecessary to provide education and address some ofthe concerns Los Angeles residents had. As of March1, 2018, Los Angeles had 37 cases of hepatitis A, 20leading to hospitalization and no deaths reported. - Through food, drinks or objects that have come incontact with feces from individuals who already havehepatitis A. - By not washing hands after using the bathroom orchanging diapers. - Sharing needles and other items to take drugs. fatigue, loss of appetite, nausea, vomiting, stomachpain, dark urine, grey stool, diarrhea, joint pain andyellowing of the skin and eyes (jaundice). Symptomsusually occur two to six weeks after initial infection. can receive the vaccine from your doctor’s office, orby calling 2-1-1 to find a local clinic. Washing handswith soap and water before preparing food is one ofthe best ways to prevent the disease, especially afterusing the bathroom or changing diapers. doesn’t mean we won’t keep on trying,” Chi said. Los Angeles County Department of Health, www. “San Diego Hepatitis A Outbreak” https://www. the Deputy City Manager, Assistant City Managerand Interim City Manager. She was previously amember of the Soroptismist International of Glendaleand a Board Member of the Salvation Army and theAmerican Red Cross. 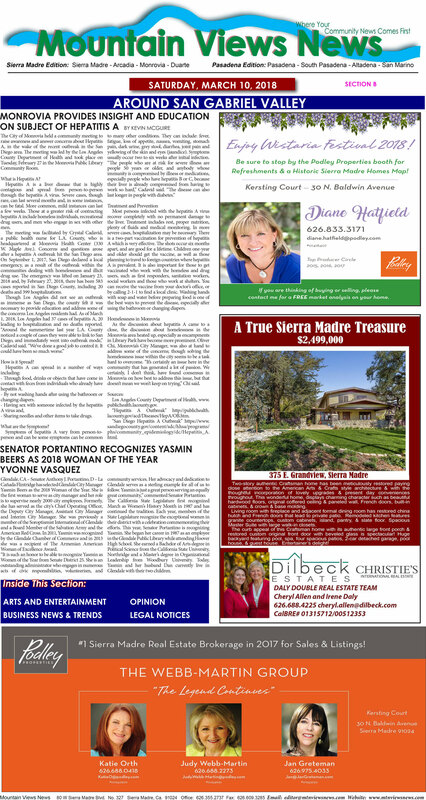 In 2011, Yasmin was recognizedby the Glendale Chamber of Commerce and in 2013she was a recipient of The Armenian AmericanWoman of Excellence Award. community services. Her advocacy and dedication toGlendale serves as a sterling example for all of us tofollow. Yasmin is just a great person serving an equallygreat community,” commented Senator Portantino. Yasmin and her husband Dan currently live inGlendale with their two children. contact me for a FREEmarket analysis on your home. Refreshments & a Historic Sierra Madre Homes Map!